Audient has come up with a top-quality dual-channel mic pre at an unexpectedly friendly price. Formerly expensive Audient mic pres at a never-before-seen price. HMX harmonic variation provides wonderful sonic colour. Quality analogue-to-digital conversion with switchable sample rates. The half-rack design won't be to everyone's taste. Each of the two channels has a different secondary knob. In these days when DAW recording rules the roost, it's becoming increasingly common to find even the most 'digital' studios looking for a great analogue-to-digital conversion solution for sound sources that are still recorded with microphones. Similarly, high-quality preamps are all the rage for ensuring that recorded elements sound as though they've been passed through a high-spec mixing console, even if a studio has no need for such a device. Into this brave digital present steps British audio firm Audient, which commands huge respect in the industry for its high-quality preamps, compressors, EQs and, most of all, mixing consoles. Much of Audient's technology sits beyond the financial reach of project studio owners, but MiCO, its new dual-channel mic pre, is certainly affordable. 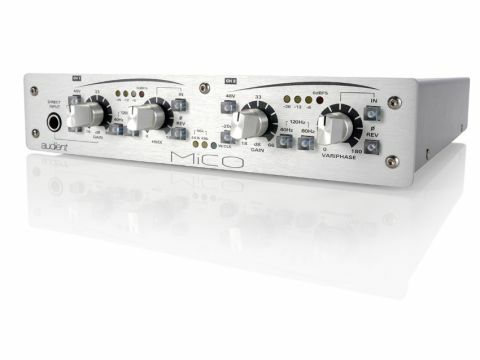 The MiCO is a half-rack unit offering controls for its twin channels on the front panel and the majority of its connectors round the back. Starting at the rear, you'll find a pair of XLR/line inputs, with direct XLR analogue outputs offered for each channel next to these. In terms of digital connectivity there's an AES/EBU port, plus additional ones for S/PDIF and TOSLink. A word-clock connector sits next to the S/PDIF output, and next to this are a series of dipswitches which are responsible for setting the MiCO's sample rate and word-clock status. Additionally, a 1/4-inch 'direct input' jack socket is located on the front panel so that instruments can be connected directly without recourse to the back panel. "The MiCO is a half-rack unit offering controls for its twin channels on the front panel and the majority of its connectors round the back." Although in some ways it's great to have compact gear, and the MiCO is wonderfully portable in its current form (it fits comfortably in a laptop bag) - there are those who have reservations about half-rack-sized gear. For a start, you need two units of this size to be able to rack-mount, to say nothing of the fact that there is nearly always an ergonomic downside. The rear-mounted sample rate switches represent that downside here, as these provide a function to which there's a good chance you'll regularly want access. A longer, single-rack unit with front-mounted sample rate switches would be more practical. Design issues aside, much greater importance should be attributed to the sound produced by the MiCO, and here we have no complaints. This comes as little surprise once you've discovered that the mic pres at the heart of both of the MiCO's channels are the same as those which feature on Audient's ﬂagship mixing console, the ASP8024, whose popularity continues to grow in pro studios around the world. At first glance, the front-panel controls seem to be identical for both input channels, but this proves not quite to be the case. The controls that are common are a pleasingly 'knobby' Gain dial, the provision of phantom power, a -20dB pad switch plus a pair of bass roll-off buttons (high-pass filters) at 40Hz and 80Hz. These can both be pressed to provide roll-off at 120Hz. The final switch that features on both channels is a phase invert button that lies next to the second rotary knob for each channel. The functions of this dial vary from one side to the other, however. Channel 1 features HMX, which is a 'harmonic variation' system borrowed from Audient's own Black Pre. This clever technology progressively enhances the harmonic content of channel 1's signal to produce a sound of deliberately increasing colouration. The simulation is designed to produce something that becomes more 'classic' or analogue-sounding as the dial is turned up, and it's certainly true that a substantial amount of sonic character can be added here. If all of this sounds like too much intervention, however, worry not - there's a toggle switch that selects whether you want to use the HMX system at all. Channel 2 also features a toggle switch to activate its second dial but rather than providing harmonic changes, it produces phase variation. Labelled Variphase, this knob lets you shift phase position between 0 and 180 degrees, which serves two purposes. You can either use the dial to phase-align a source plugged into channel 2 to provide continuity with the signal at channel 1 (such as a microphone/DI combination), or you can get creative and shift around one side of a stereo source to produce some unusual results. Either way, this dial serves a useful function and is more practical than having a second HMX control, even if the latter is what we'd first anticipated! The MiCO might be a somewhat unexpected product, but it's also an extremely welcome one. There's nothing else quite like it in its price range, and this could well be its strongest selling point - after all, who would have thought a two-channel microphone preamp from big hitters Audient would become available for less than a paltry £400? We're not totally convinced of the merits of half-rack gear for the reasons explained above, but there's little else to fault this box, especially as it brings some high-quality, super-expensive technology into the hands of us mere mortals. If you're looking for a truly great-sounding mic pre, offering two channels of input with a digital output to send pristine signals to your audio interface, we certainly have no hesitation in pointing you in the MiCO's direction.